Sec. of State John F Kerry is bragging about how he got Iran to make an agreement with ut. But some people say it's not much of a deal. Senator Kirk of Illinois put it together. Iran gets to continue developing nuclear weapons. The rest of the world gets nothing except a piece of paper with a signature that John F Kerry can wave around. Via Breitbart. See Senator Kirk. 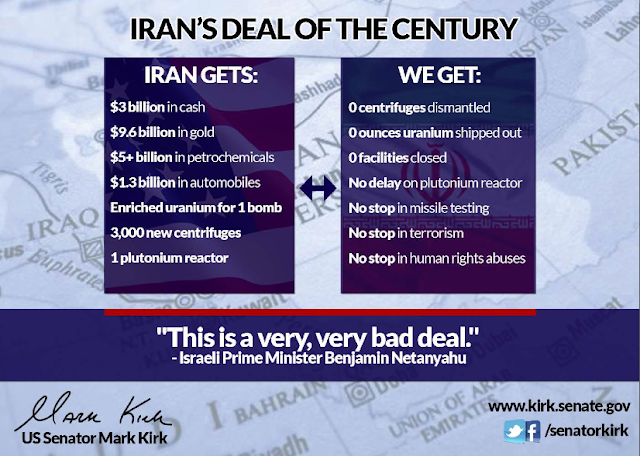 The graphic - from Senator Kirk. Click to enlarge.